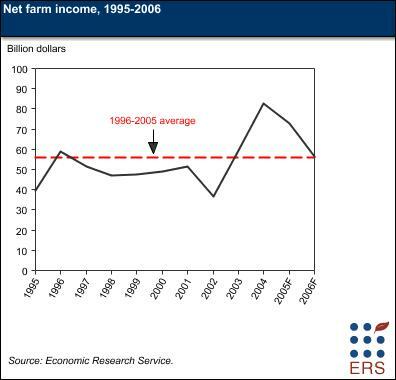 2005: Second Highest Net Farm Income In History. The pending $1.5 billion bonus subsidy in the Senate's emergency supplemental appropriation comes as U.S. agriculture posts the second-best net farm income in history — income after all farming expenses, including fertilizer and energy — and as taxpayers have been saddled with record levels of farm subsidy payments. According to USDA, in 2005 net farm income is forecast to be $72.8 billion, following the $82.5 billion record set the previous year (see chart). USDA projects a further decline for 2006 to $56.2 billion, but even this level is still above the 10-year average. As USDA explains, "The 2-year period 2004-2005 was one of unprecedented income creation for the U.S. farm sector, when both crop and livestock commodities experienced exceptionally favorable market and/or production conditions. "4 Cash receipts were surprisingly strong for crops at $114.1 billion, the second-highest year on record, in part because weather-related damages to crop yields were much lower than anticipated. In Illinois, for instance, mid-season concerns that drought would result in a dramatic drop in corn yields were belied by an unexpectedly large harvest. Moreover, USDA notes that "the income earned by farm operator households in 2005 is expected to continue a 5-year string of increases." According to the most recent USDA estimate, farm operator household income will average $83,461 in 2005. The most recent estimate available for all households shows average income much lower, just over $61,000 (for 2004). 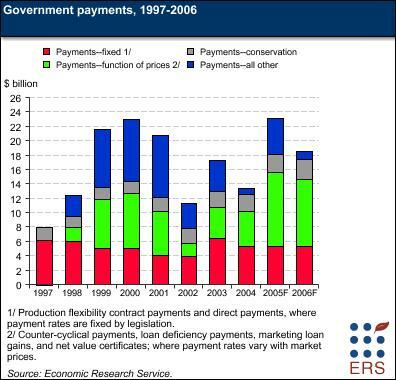 2005: Record Farm Subsidies. Farm subsidies in 2005 will set a record of $23 billion, just above the previous mark of $22.9 billion in 2000 (see chart below). 4Covey, et al., op cit.